Every year we try and do our bit for the local community. This year we’re helping a cause very close to our hearts, Babbington Rescue. They helped Roman, our very own studio mutt after he was abandoned over 3 years ago. He’s clearly a much happier dog now he’s got his very own Christmas jumper…don’t you think? For every Christmas card we’re sending out to our clients and suppliers this year we’re donating £2.50 to support Babbington. We’d love it if you would help us raise even more. As well as fundraising we’ll also be volunteering our time on News Years day and also providing all the current furry residents in the rescue kennels at Babbington a Christmas present which we’ve been putting together over the past few weeks. There’s still time to send us dog treats, old blankets, food and toys for the Christmas packs we’ll be giving to the dogs currently being cared for at Babbington. 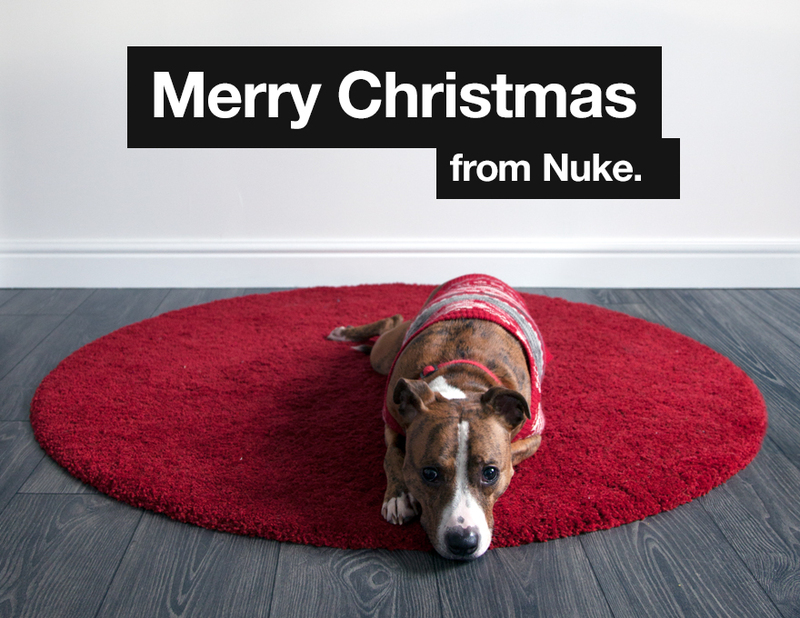 If you’d like to send us something you can get in touch with us through our contact page or simply post them to Studio at Nuke Creative Ltd, 25 Nimbus Way, Watnall, NG16 1FP labelled ‘Secret Santa’. Babbington Rescue are a non-profit, non-funded organisation who provide care, security and new homes for abandoned dogs and cats. They depend on support from ordinary people like us to help them do what they do. Babbington have a none destruction policy and deal with almost 1100 dogs a year, this represents over 1% of the total UK stray and abandoned dogs annually as recorded by the Dogs Trust. Since the rescue changed hands in mid 2003, they have found homes for nearly 4000 dogs, who through no fault of their own came into Babbingtons care. Visit their website to find out more about Babbington Rescue and what they do. We’ll be posting updates here and on social media following our visit to the rescue centre on New Years day, with plenty of pics and stories about how the money raised will go to help the abandoned animals rescued by Babbington. So, watch this space. Many thanks to everyone who gets involved and helps us support Babbington Rescue this Christmas.